May 2nd is Authors for Indies Day! Across Canada authors will be at their local independent bookstores helping to sell books and show their support. I can’t wait to talk books and share the love of reading. 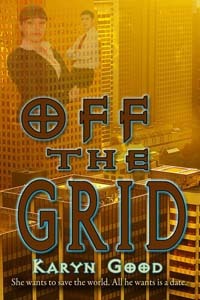 Off The Grid will be touring around in February and the first part of March on a review tour. 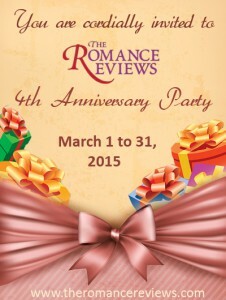 Come join the party at The Romance Reviews for a chance to win great giveaways including books and gift certificates, play games and meet authors. The Grand Prize is a $100 gift card. On the homefront, January was filled with books and writing. The sun is rising earlier and setting later. But there is still much writing to be done and many books to be read. The weekends are for reading the paper, omfort food, and shoveling snow. It is for digging in and perserving against harsh conditions. At least, in my neck of the woods. Although to be fair, the conditions have been rather pleasant for January. Over my Saturday morning cup of tea I open the Weekender section of my local paper and head to the Books page. I check out the best sellers in hardcover and paperback. Then I read the article of the week which is usually an interview with an author. I love learning where other writers get their ideas, what their process looks like, and I love it when they share their opinions. On occasion they are forced to defend their writing. One such interesting article stayed with me. It was an interview with Val McDermid, a crime novelist who addressed the notion of female crime novelists and the voilent subject matter of their books. Or more to the point, the suggestion that because she is female, it is somehow wrong for her to write about such matters. These questions arose, perhaps in part, due to the backlash against the overwhelming number of faceless female victims in books in which their only role is to be beaten, violated, and then hacked to pieces. What I found interesting, however, was her perspective on the psychology of females writing crime fiction. I know know I have walked and listened and wondered. Now I’m wondering how much my gender affects my writing, perhaps not when it comes to my vicitms but when it comes to the villains in my story. To this point, they are one hundred percent male. All dominant personalities in positions of power with violent tendancies. Not that women can’t be all those things. But maybe the things I’ve been conditioned to fear and protect myself against manifest themselves in these characters. Something to think about…and maybe think about mixing it up a little! How about you? Any book recommendations with regards to crime fiction? Have you read any books with a fascinating female villain? 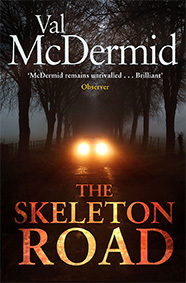 Set in McDermid’s hometown of Edinburgh, The Skeleton Road centres on a Cold Case investigation. A skeleton is discovered, hidden at the top of a soon-to-be renovated Gothic building. 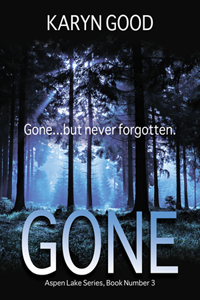 Detective Karen Pirie is tasked with identifying the decades-old bones and soon finds herself unearthing a series of past conflicts, false identities and secrets that have long been buried. This month I’m happy to be visiting the Laughing Ladies Literary Book Club who’ve chosen OFF THE GRID for their January read. I’ve had a blast oming up with discussion questions and anticipating more questions about the characters and the setting and the inspiration behind the book. I’m also hard at work writing the third book in my Aspen Lake Series. Mike and Grace’s is coming along. 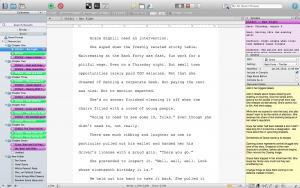 For me, the hard part of writing is getting down the first draft. I love revising. Taking the bare bones of a story and turning it into something someone might want to read someday. I love taking photos. I’m not very good at it and definitely fall in the amateur department. But I decided to take part in a photo challenge this year. You can read more about it here. There is a prompts to help you out every day. Here’s a sampling of mine and you can find me on Instagram @karyngoodauthor. 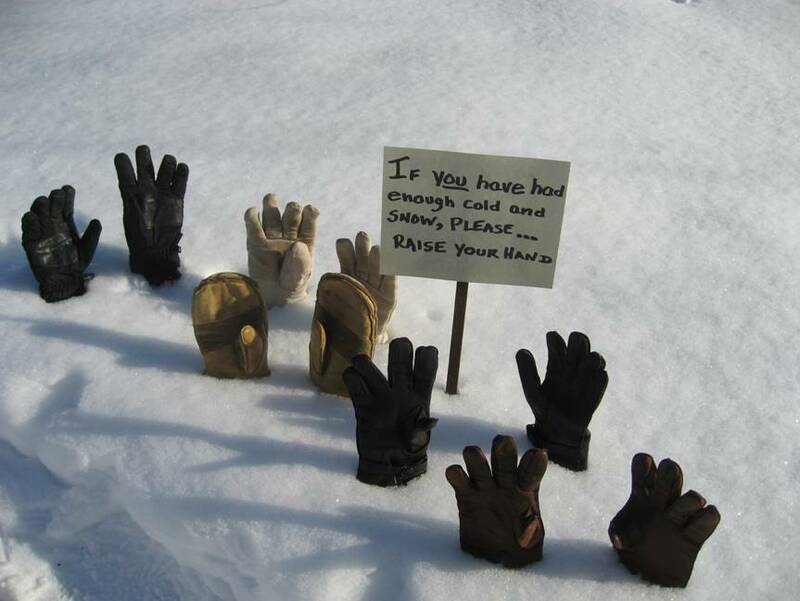 Hope the weather is being kind to you. And if you’re being subjected to nasty weather and storms I hope you have plenty of good books to keep you entertained. One day until the end of November and it’s snowing. Again. NaNoWriMo is over. Mustaches and beards disappear. Hopefully. And all is well with the world. Except here comes Christmas. I used to be an uber organized person. Now, I’m not. I don’t know what happened. I have no excuse. The good news is I remember most things. November did see me taking part in a writing challenge, just not the official NaNoWriMo. 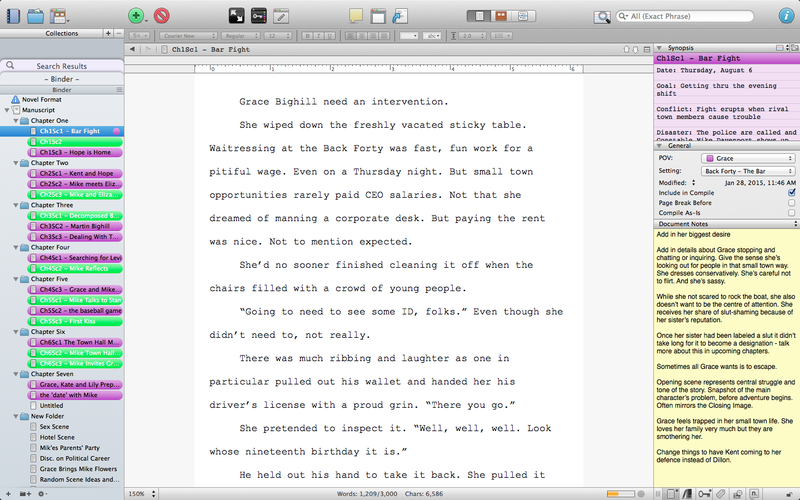 At this point slinging out 50,000 words that require major rewriting at the end of it doesn’t work for me. I tried it once. I ‘won’. I ditched 95% of those words but have kept the same characters and the same town. That’s it. I’m much happier with the story this time around. My goal for November was 500 words a day. It was an informal challenge supported by my writing group. We weighed in everyday on our private Facebook page and inspired each other. I didn’t keep super strict track but I’m pretty sure it’s all evened out and I’m on pace to slightly exceed that goal. Obsession (Kate and Seth’s story) is currently sitting at 30,745 words. 13,693 of those words written prior to November. Here’s a sneak peak at the first paragraph. Kate Logan figured hiking the long road back to self-respect sucked at the best of times. These weren’t the best of times. The splintered wood of her boutique’s back door jamb was rough and sharp under her fingers. With her bank account sitting at next to zero, repairing the break-in damage was an expense she couldn’t afford. She had insurance, but collecting took time. I’m also working on a manuscript called Off The Grid. Today I signed up to pitch it to Harlequin’s Dana Hamilton on January 4th as part of their Speed Dating with Editorial Assistant Dana Hamilton opportunity. We’ll see what happens. And this morning I was busy jotting down an idea for the first scene of the third book in a trilogy that doesn’t have a book one or two. Just plenty of ideas about three adopted brothers and three women who understand about sacrifice. 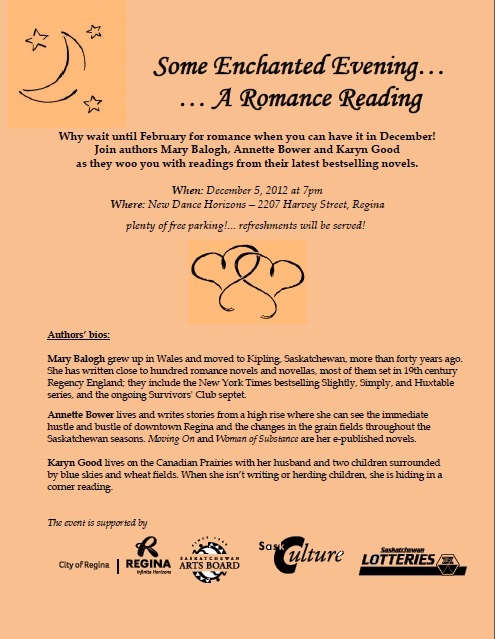 On December 5th I’m giving a reading along with Mary Balogh and Annette Bower called Some Enchanted Evening…A Romance Reading. If you happen to be in the Regina area, join us at New Dance Horizons at 7:00 pm! Starting December 1st I’m offering a Goodreads Giveaway for two copies of my romantic suspense, Backlash. It’s open until the 15th of January. You can find me guest blogging today at the home of Silver James. I’m talking about my book club and giving away an ebook copy of Backlash! you can learn a bit about Silver James and her Moonstruck Series on Amazon starting with Blood Moon. 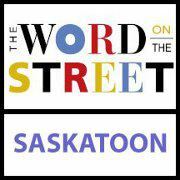 On Sunday I’ll be attending Word On The Street, Saskatoon. It’s a Canadian magazine and book fair that is taking place in several major cities. Here’s the link in case you happen to live in one of those cities. I’ll be out and about talking about my debut romantic suspense, Backlash, that releases on June 1st. I’ll also be talking about inspiration and suspense and a host of other things for the month of June at different places. Please feel free to stop in and leave comments. The comments on the Goddess Fish Promotion Tour will be entered into a draw for a $25 gift certificate from Amazon. There are a couple of other giveaways as well as the contest on my blog. Follow along and enjoy the festivities. I’m going to be in two different places today as I go out and about promoting my debut romantic suspense, Backlash. Yay! June 1st is the official release day and I’m so excited! The countdown is on and I’m celebrating by giving things away. 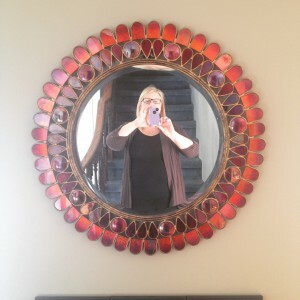 I’m also excited to be guest blogging about small towns over at Janet’s Journal and hanging out with my friend and the good folks over at her place. I’m also giving away a short story I wrote called, Waiting for Mason. To get a copy all you have to do is leave a comment with your email address and tell me your favorite fictional setting. As well, I’ll be visiting at Long and Short Reviews doing an Author Interview. I’m giving away a prize there, too! A $10.00 gift certificate to The Wild Rose Press. 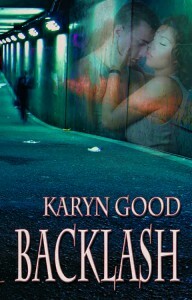 Backlash is available in print from The Wild Rose Press and Amazon. It will be available also available in ebook come June 1st. I participated in a reading last week at a lovely small town Saskatchewan library along with a friend of mine, Annette Bower. 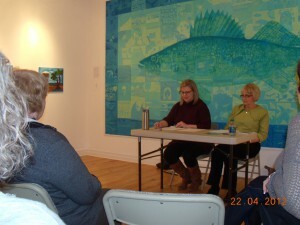 I read from my romantic suspense, Backlash, and she read from her newly published e-book, Moving On: A Prairie Romance. An old converted school house with original tin ceilings and hardwood floors, it contained a small library and an art gallery. We read in a cosy room in front of a beautiful mural created by young local artists to fifteen or twenty interested attendees. I thought about all those times I’ve read books to save my sanity. Like recently, when I found myself awake at 2:00 am three or four nights in a row because I was coughing and couldn’t sleep. Tucked up in bed, propped up against a mound of pillows, Vicks Vapor Rub smeared on my chest, waiting for the cough medicine to kick in, I poured through four books. On those bi-monthly weekend Greyhound bus rides from Regina to Saskatoon to visit my now husband in my twenties. Airports, hotel rooms, doctor’s offices. What do people do in these places if they aren’t reading? Okay, excluding hotel rooms! On our way home from the reading we talked about creative ways to promote ereaders and ebooks. Someone mentioned their niece reading on her ereader while breastfeeding her baby. Oh, how I wished I’d had one way back when to pass those long hours. It’s been a long day and the next one promising to be just as long. What do you do? You pick up a book and allow the story to sweep you away. There’s nothing quite like immersing yourself in a great book. I’ll even take a not-so-great book over no book. I’ve used books to soothe away teenage angst. I remember once, shortly after moving away from home for the first time at eighteen, a group of girlfriends got together one night to watch the movie: Texas Chainsaw Massacre. I read an entire Harlequin romance once I returned home to my dark, little, very empty house. I don’t remember the name of the story, but it saved my sanity that night. When has reading saved your sanity? 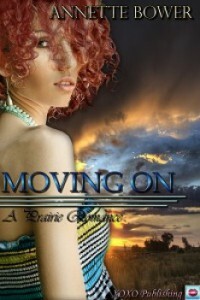 I hope you check out my friend, Annette Bower and her new release, Moving On – A Prairie Romance. 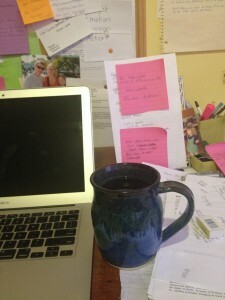 It’s Thursday and we’re taking our Travelling Blog Show on the road to Joanne Brothwell‘s blog. This week’s topic? What is the creepiest thing that ever happened to you that you couldn’t explain? I kid you not, that’s what we’re dishing on this week. 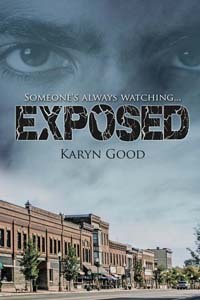 Come join Janet Corcoran, Hayley Lavik, Jana Richards, Joanne Brothwell and myself as we confess to the creepy. We love to hear your about your experiences and hear your opinions! This Saturday, April 21st, at 1:30 pm I’m at Chapters (in my home city of Regina, SK) reading from my writing group’s anthology: Love, Loss and Other Oddities: Tales from Saskatchewan. I’ll be sharing my time with four other lovely Saskatchewan authors: Annette Bower, Jana Richards, Anita Mae Draper, and Jessica Eissfeldt. Join us for an afternoon of reading. On Thursday, April 26th, at 7:00 pm I’ll be at the Regina Beach Library reading from my upcoming release, Backlash. 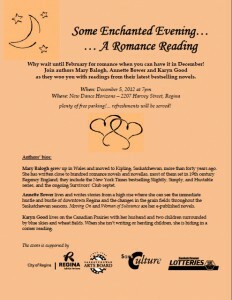 I’ll be joining Annette Bower as she reads from her new release: Moving On: A Prairie Romance.